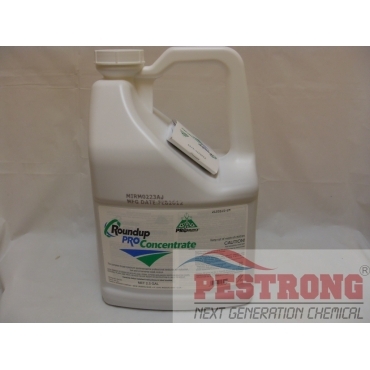 Where to Buy Roundup Pro Concentrate, Roundup Pro Concentrate - 2.5 Gal - $76.95 for Sale with Fast Free Shipping! Roundup Pro Concentrate - 2.5 Gal has a more concentrated formulation and proven surfactant technology allowing for crews to spend less time mixing, handling and rinsing containers and more time spraying. Higher concentrated with 50.2% Glyphosate Herbicide is a high quality fast acting systemic total vegetation weed killer that delivers unsurpassed weed and brush control that’s rainfast in as little as one hour. I have tried quite a few non-selective herbicide and decided this is the one for me, works really well. Have used roundup many years. Found this to be best and have been buying it from Pestrong for several years. I have tried most non selective herbicides out there. This one is the winner hands down ! Pestrong always has the best price and fast and free shipping. This is no doubt the best non selective herbicide out there. Spray it on and give it a few days and everything is dead. Peststrong also has untouchable pricing and super fast shipping. As always, Roundup from Monsanto, with its higher concentration, proved to be the best product I have used to control unwanted grasses and weeds. The quick free delivery was greatly appreciated as well. I prefer this non-selective weed killer, since it kills everything down to the root! Excellent product! Best quality and performance with Regards to quantity necessary in mixture. Excellent price compared to others I've checked. I'm especially happy with the large 2.5 Gallon size available. Definitely will reorder! looking for this product when winter season. This is an AWSOME product. We have tried several products and none work as well as this does. We have found that dollar weed and bleeding heart vine is the worst to get rid of but this Product killed them both.. LOVE IT. I buy it all the time and shared with family and friends. Good price. This is the Monsanto molecule, not the generic, this works better. More stronger, more power. It is good product. It provides broad spectrum control of many annual weeds, perennial weeds, woody brush and trees as post-emergent. This stuff killed all the weeds including the ivy that was on the ground that no other stuff worked on.. It works great.